Lines of code unearthed in Apple's first iOS 12.1 beta, released earlier on Tuesday, suggest a future version of the operating system will support syncing of Memoji characters over iCloud, a feature that points to potential integration with a rumored iPad Pro with TrueDepth camera array. Further spelunking reveals references to an "iPad2018Fall," hinting that the device could launch soon. Included in the initial beta release is a new daemon called "avatarsd," which 9to5Mac believes will be used for syncing and storing Memoji data through iCloud. Not much is known about the feature as it is currently restricted to iOS 12.1 builds distributed internally at Apple. If avatarsd does indeed sync Memoji over iCloud, however, its existence suggests Apple is working to build its TrueDepth sensor into devices beyond iPhone. Introduced with iOS 12 on Monday, Memoji is Apple's take on customizable 3D avatars. Similar to Animoji, animated emoji characters introduced in iOS 11, Memoji react to head and face movements captured by iPhone's TrueDepth camera. User-created Memoji are stored on a local device, which is currently limited to iPhone X, but will expand to iPhone XS and XS Max on Friday. Save for the handful of people who own and use multiple iPhones, syncing Memoji to iCloud makes little sense and would be an unlikely candidate for iOS 12.1 unless something else is coming. While mere speculation, Apple could be preparing for an as-yet-unannounced device with TrueDepth integration, one that is used in conjunction with or addition to iPhone. A prime candidate is a much-rumored next-generation iPad Pro. Reports last November first suggested Apple was at work on an iPad revamp that ditched Touch ID for Face ID biometric authentication, a change expected to afford space for a nearly edge-to-edge display. Code uncovered today hints at support for Face ID in landscape mode, seemingly backing up months of rumors. Some believed Apple would announce the new iPad Pro at its September event, but the company reserved last week's gathering for iPhone XR, XS, XS Max and Apple Watch Series 4. In fact, Apple only used its annual iPhone event as a platform to introduce new iPad products once in 2015 with the iPad mini 4. The company typically unveils its latest and greatest slates during a separate event in October, though the second-generation iPad Pro debuted last June. Indeed, code in the latest iOS 12.1 beta references an "iPad2018Fall" device identifier, hinting that Apple will maintain it usual October launch cycle this year. What’s the likelihood of Apple integrating the True Depth array into its MacBook Pro and MacBook lines sometime in the near future? Haven’t gone anywhere near touchbar equipped Mac cos it seems pointless and they seem to be depreciating TouchID. 1) It seems likely that they'd use that tech for Macs, but since macOS is designed with multiple users in mind wouldn't they have to allow for multiple faces to be recognized accurately for different logins? Since you need to input your passcode before the biometric is active it may be able to load the Face ID data after you've logged in and if that unlock screen for a logged in user is present. Touch ID does allow for 3 fingerprints, which is less than for iOS since its launch. Maybe with the T3 chi that issue the single face limitation will be resolved. 2) Deprecating Touch ID or not doesn't mean that those Macs won't work after Face ID is introduced, just like your current Mac didn't stop working after Touch ID and Touch Bar were introduced. I also don't see the Touch Bar going anywhere if Touch ID is replaced with Face ID. At this point, wait a month to see what Apple offers up in October, but after that if you need a new Mac I'd get a new Mac. The iPhone and the Apple Watch are updated together and the iPad and Mac are updated together. Apple thinks tablet will eventually replace computer and watch will eventually replace phone? Face ID could make multiple user accounts more interesting. Now we are at IOS 12.0 (11 years on) and the home screen still looks the same (grid of icons) with no native functionality to change the number of rows, columns or the spaces between the icons. iPhone XS release is only a few days away and the Max model (maybe should have been called iMax ) likely has the same grid with even bigger icons. I would like to hear of a modern home screen UI project at Apple instead of Memoji syncing, Group FaceTime and other assorted pieces of 'functionality' ... anyone else? 1) The grid has changed several times. Originally it had 5 rows. With the 4" iPhone 5 they were able to make it 6 rows. With the iPhone 6 series they were able to make it 7 rows. They've also made it possible to adjust the number of icons in the bottom row and they've added folders. Then there are the countless changes to the Home Screen in general, like pulling down on the Home Screen to access search and swiping to the right to see your widgets. 2) It's fine that you wish things would change but you should at least have a reason and a solution in mind. So, if not icons in a grid what you do propose? Personally, I can't think of a better solution than having icons displays in a grid and I'm not fan of the Watch icon layout which is why I switched it to a scrolling list. I'd like to see some basic widget options you can nest in the rows of icons, as well as the ability to pin icon flow to different corners. For the former, Android has been doing this for years if you need a visual, and the latter would taking the upper-left pinning to, say, the bottom-right, which would make it easier for me since I'm right handed and it's easier to tap icons that are lower on screen when holding the device with the same hand you're tapping with. That said, not doing it isn't a deal breakers for me and for all I know they may not work for a variety of reasons or interfere with future plans. Apple execs always mispronounce me-moji as “ma-moji”. Thats the look and feel of an iPhone. The Mac also has the same type of iconography from 30 years ago. They added widgets and control centre and notifications sheet and search and more. 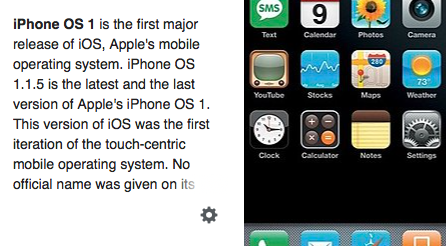 The genius of iOS is the simplicity. IMO they need to fix the home screen not by adding new features but by fixing all the bugs in the existing home screen UI. Rearranging apps and using folders is as buggy as all hell. They fixed some bugs in iOS 11 and 12, by rebuilding it, but they created as many bugs as they got rid of. I've done that as much as I can right now. I'm even going on an unprecedented 3rd year of using the same iPhone because I'm most using my Watch and Mac. This year, with the new streaming audio APIs for watchOS 5 I'm hoping that Spotify and SiriusXM become standalone apps so I can reduce my need for my iPhone even further. That said, the Watch display is so limited in size that will probably always need to be tethered to another Apple device with a larger display for setup and OS updates, but I'd like that the iPad and Mac to be options for that. If that happened I may not buy another iPhone for a long time, but I'd probably buy an iPad to see if that can be my intermediate device that is easier to travel with over my Mac but offers a richer experience than my iPhone. The grid works OK and I didn't mean to suggest a complete departure to some alternative paradigm. I just think the grid parameters are overdue for added flexibility, particularly with the iPhone XS Max having all that gorgeous real estate available. Perhaps icon sizes could be a changeable option (extra small, small, normal, large, extra large) with the rows and columns increasing / decreasing according to the icon size setting. That’s where wearables are headed though. Eventually we won’t carry phones.